The following sermon was preached in the seminary’s Martin Luther Chapel by Dr William Mundt for the Festival of the Holy Cross (transferred) on Friday, 13 September 2013. “Why do Christians venerate an instrument of execution?” is a question I have been asked. Perhaps you have also received it or a similar inquiry. It does indeed appear odd that we should exalt two rough-hewn timbers bound together to form a cross, upon which a condemned criminal was hoisted and usually bound—or in extreme cases nailed—in a public place to warn anyone contemplating committing crime in this city that Roman justice was swift and severe. Before a crucifixion came the interrogation: confession of a crime was “encouraged” by a beating with rods, spitting and mocking, and of course whipping. Although the Hebrews limited the strokes to forty, the Romans had no such restriction. The “flagrum” contained long pieces of bone and metal that lacerated the flash. Eusebius of Caesarea noted that the prisoner’s “veins were laid bare, and that the very muscles, sinews and bowels of the victim were exposed”. After all this, and the mockery of two trials and a night without sleep or food, Jesus was led to Golgotha. Farrar adds: “The unnatural position made every movement painful; the lacerated veins and crushed tendons throbbed with incessant anguish; the wounds, inflamed by exposure, gradually gangrened; the arteries, especially at the head and stomach—became swollen and oppressed with surcharged blood; and while each variety of misery went on gradually increasing, there was added to them the intolerable pang of a burning and raging thirst; and all these physical complications caused an internal excitement and anxiety; which made the prospect of death … bear the aspect of a delicious and exquisite release” (MacDowell 205). Even Cicero realized the abominableness, the inhumanity, of this torture. He wrote: “Even the mere word, cross, must remain far not only from the lips of the citizens of Rome, but also from their thoughts, their eyes, their ears.” Yet we still want to sing, “In the cross of Christ I glory, tow’ring o’er the wrecks of time. All the light of sacred story gathers round its head sublime” (LSB 427)? Of course, we try to explain to others, the cross, that instrument of execution became the means of our deliverance from sin, death and the power of hell. It is another case, like that in our text, when the curse becomes the cure. The story is quite simple. The Israelites grumbled—again (which always makes me thinks that the lost ten tribes did indeed move north and become Germans!). Fiery serpents brought death. A fired serpent—made from bronze and placed on a pole was to provide the cure for those who looked to it. You can imagine the outcry: We are not going to worship a snake! That’s what bit me; how can it help me? Of course modern medicine uses a similar approach by injecting mild doses of illness so the body can build up resistance through antigens, but that is not what is happening here. Cause and effect are tied tightly together. Grumbling brought punishment, and rightly so. It is all a violation of the first commandment. There was no fear, love or trust of the Almighty demonstrated by their behaviour. Suffering and death are the inevitable results of actions and attitudes against the Lord of Life. So serpents came and did what serpents naturally do: bite and kill. In looking to the serpent on the pole for rescue the grumblers were forced to remember their disobedience which caused it. To get the cure from the curse you just need to drop the “s”, or the “s-word,” whether that be serpent or Saviour. Each time we look at a cross we can imagine ourselves hanging there, for “the wages of sin is death.” The Israelites were rightly condemned for their disobedience and suffered immediate consequences. We are usually able to forestall direct punishment and may therefor begin to believe we can sin with impunity. But the cross and the suffering Christ remind us that sin is no little or light matter. It is, deadly serious business. But at the same tie when we look at a cross we notice it is either empty, or in the case of a crucifix, the Christ is suspended there. That is the Gospel, the reminder that Christ has taken our place, died for us and rose again. In either case we do not see ourselves on the cross because by grace, through faith, on account of Christ, we have been forgiven, justified, set free from the curse of sin, death and Satan to receive the cure Christ obtained for us. “The origins of this festival are found in the early decades of the fourth century, when St. Helena, mother of Emperor Constantine, undertook an archaeological search for the cradle of Christianity in Jerusalem. The holy city had been rebuilt under the Roman Empire following its destruction in the first century (as our Lord Jesus had prophesied). While some of the details, including the precise nature and extent of St. Helena’s involvement, cannot be established with absolute certainty, there are various reliable witnesses to the basic facts of the case. The presumed sites of our Lord’s crucifixion and burial were uncovered, dug out from under the rubble of Jerusalem’s destruction and rebuilding. Tradition says that three crosses were discovered in this process, and one of these three was presumed to be the cross on which Christ Jesus Himself had been crucified. This was in September of A.D. 320. When basilicas had been erected on these holy sites and were dedicated fifteen years later, in mid-September, A.D. 335, the remnants of that ‘true cross’ were housed within the Basilica of the Holy Sepulchre. In subsequent years those remnants of the cross were used ceremonially in annual commemorations of these several events, that is, the uncovering of the sacred sites of our Lord’s death and burial, the discovery of the cross, and the dedication of the churches. “A few hundred years later, after the cross had been stolen away to Persia and later recovered under Emperor Heraclius, the Feast of the Exaltation of the Holy Cross on the 14th of September celebrated its restoration as well as all of the above historical events. This was an Eastern festival, to begin with, but one that was adopted in the West in due time. In western practice, Holy Cross Day determined the autumn ‘ember days,’ the Wednesday, Friday and Saturday following the feast, when prayers were offered for the fruits of the earth. Thus, the Cross of Christ, by which He redeemed His creation from the curse of sin and death, was raised against the approach of winter. “The Feast of the Holy Cross has similarities to Good Friday in its focus on the Passion of Christ and His death by crucifixion. Celebrated, though, outside the penitential solemnity of Holy Week, the focus of this festival day is more exuberant in its exaltation of the Cross as the instrument by which our Lord has achieved His victory over all the enemies of God and His people. Here He is raised as the ensign of the nations, by which He draws all people to Himself (as He declares in the Holy Gospel of the day). One of the chief hymns appointed for this feast, ‘Sing, My Tongue, the Glorious Battle’ (LSB 454), is also used on Good Friday, but there it is restrained by the reverent sobriety with which we deeply mourn and bewail our sins and iniquities, for which the Lord of Glory was crucified. Here on Holy Cross Day, the same hymn enables us to sing the keynote of the feast: We hail the ‘faithful cross’ as a ‘true sign of triumph.’ It is ‘the noblest tree,’ excelling all others in foliage, blossom and the abundant fruit of Christ (stanza 4). Thus do we exhort ourselves and others: ‘Now above the cross, the trophy, sound the loud triumphant lay; tell how Christ, the world’s redeemer, as a victim won the day’ (stanza 1). “Although there will always be some question concerning the origins of Holy Cross Day, this festival invites an appropriate and salutary focus on the Cross as the means by which our Lord Jesus Christ atoned for the sins of the world, defeated death and the devil, reconciled the world to God, obtained our salvation and glorified the Father’s name. Though His Cross is a foolish scandal to the world, to us who are being saved it is the power and wisdom of God, unto salvation. Thus, with St. Paul, we know nothing but the Cross, preach nothing but the Cross, and boast in nothing but the Cross of our Lord Jesus Christ. For it is by His Cross that we are crucified, dead and buried with Him in Holy Baptism and in daily repentance, and from the same Cross that we receive the absolution or forgiveness of all our sins, by which we also rise with Christ unto newness of life. 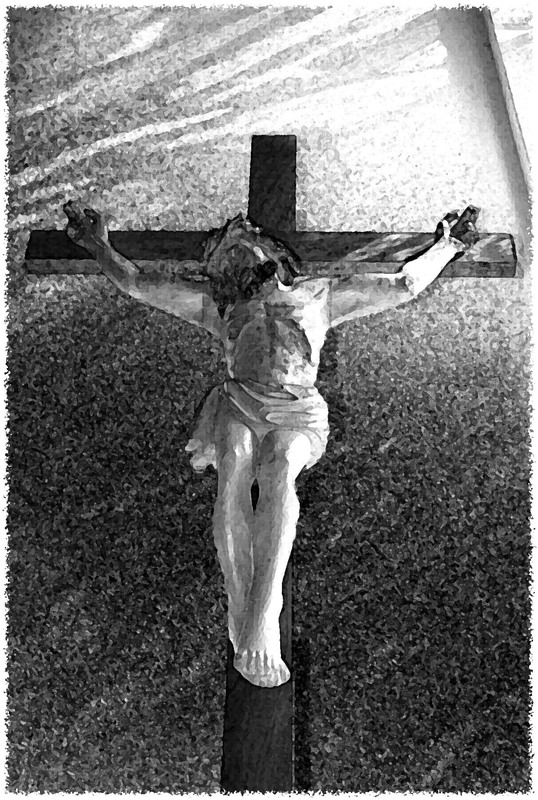 This Cross is lifted up and exalted in our lives by self-sacrificing love for our neighbour, as it is first of all lifted up for us by the preaching of the Gospel, by which we are drawn to Christ in faith and through Him, our great High Priest, brought into the holy of holies made without hands, to our Father in heaven. Let us give thanks to God again today, as the ancient Israelites who received the promise offered through the serpent on the pole did, because He is gracious and merciful and indeed knows how to turn curses into cures. IJN. Amen. These words are very much what we needed to hear today.